Corby Town have been relegated from the Vanarama National League North, despite a fine fightback to claim a 2-2 draw at Stockport County. The Steelmen’s fate had been all-but sealed when they were beaten 1-0 at Bradford Park Avenue but their return to a lower level after just one season was rubber-stamped, even though they snatched a late equaliser at Edgeley Park. Stockport threatened first with Oliver Sutton saving from Richard Brodie while Greg Mills shot wide at the other end. 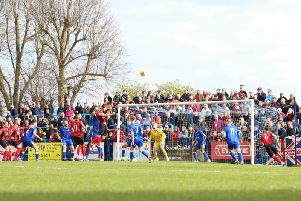 John Marsden struck the post for the hosts before Mills threatened again for Corby when he found the side-netting after cutting in from the right. Stockport were denied by the woodwork again when Brandon Wilson’s shot struck the crossbar but they did take the lead shortly after Nathan Evans had brought a save out of Dean Henderson. And it was Wilson who broke the deadlock just before the break with a fine 30-yard strike. Mills was off target with a shot soon after the restart while Sutton made a decent save to deny Kayode Odejayi. But Stockport did double their advantage just before the hour when Paul Connolly netted from a corner. The Steelmen, however, didn’t give up and they pulled one back with nine minutes to go when Ben Milnes converted Michael Ogilvie’s cross. And the comeback was complete two minutes into stoppage-time when Mills was brought down by Danny Morton and the frontman picked himself up to send Henderson the wrong way from the spot. With their relegation now confirmed, Corby will now prepare for their final home game of the season next Saturday when they take on Stalybridge Celtic at Steel Park.